It is now 30 years since Soviet leader Mikhail Gorbachev began the process of perestroika in the USSR, launching a chain of events that eventually ended with the collapse of the Soviet Union. 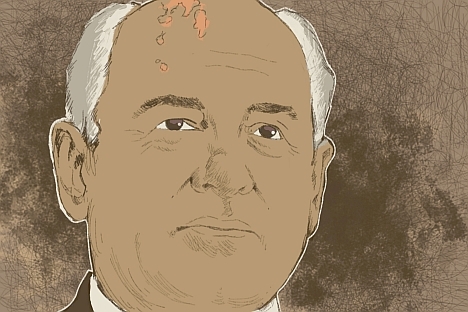 In an RIR exclusive, Gorbachev shares his thoughts on perestroika and its consequences and argues that many of the political and economic problems currently facing Russia and the world are the result of a failure to seize the chances offered by perestroika. Thirty years ago changes began in the USSR that transformed the aspect of the country and the world. History allotted a relatively short term to perestroika: less than seven years. Yet people continue to discuss it. I believe that today it is necessary to understand what happened in those years and why it happened the way it did. First and foremost, perestroika was a response to a historical challenge that the country was facing in the last decades of the 20th century. The awareness of the need for fundamental change was universal back then - both in government and in society. In the 1980s the country was going through a difficult period in its development. Problems had accumulated throughout the decades and needed to be dealt with urgently. Some attempts at solving these problems had a systematic nature. Such was the agricultural reform approved by Alexei Kosygin, which was based on analyses and work done by scientists and economists. It was an attempt to free the economy from diktat, to give people and entrepreneurs more opportunity to show initiative. However, Kosygin's reform was blocked. In fact, the decision to block it was made during the plenum of the Central Committee of the Communist Party of the Soviet Union. And this means that the problem was political. I remember one conversation with Kosygin. I asked him directly: "Alexei Nikolayevich, why did you concede, why didn’t you insist on the realization of your proposals?" He looked at me rather attentively and responded calmly: "And why didn't you support the reform during the plenum?" I did not know what to say. There was another factor. Leonid Brezhnev proposed dedicating one of the plenums to the problems of scientific and technological progress. The proposal was accepted, since our backwardness in this field was becoming more and more obvious. We created a committee to prepare the plenum headed by academician Nikolay Inozemtsev. The committee did a lot, making serious suggestions. Today there is an entire sack of these suggestions in our archive. But everything remained on paper, since the plenum never took place. Time had been lost and only in the middle of 1985 did we organize an all-Soviet Union conference dedicated to the problems of scientific and technological progress. The thing is that for many years the country's leadership had refused to reform the system. The centralized administrative command system hindered people's initiative, holding the economy in a straitjacket, while punishing - and punishing hard - those who did demonstrate initiative. As a result, by the beginning of the 80s we were by two and a half times behind the leading countries as far as industrial productivity was concerned, and four times behind in the field of agriculture. The economy was militarized; it was becoming difficult for it to support the arms race. Its structure was twisted towards the mining and extraction sectors and heavy industry. The country, which had 40 percent of the world's resources and a talented and highly educated population, was incapable of satisfying many of the people's basic needs. People had to stand in line and run after "deficit" goods. Society was becoming adamantly convinced that it could no longer live in this way. Changes were knocking at the door. We had to welcome them, risky and dangerous as they were. But the changes could not start by themselves. For them to become possible a lot had to happen, without which perestroika could not have begun. These changes became possible after Stalin's death, after the 20th Congress of the Communist Party of the Soviet Union, after a new generation of politicians assumed leadership in the USSR. I can say that we started changing not for honors and fame but because we understood that people deserved a better life and more freedom. Because people have the right to participate in solving the issues that determine their future and the future of their country. At that moment we saw perestroika as part of a global process, taking place in an interconnected and interdependent world. The global problems concerning us today - security, poverty and backwardness, the ecological crisis - were telling us that we had to combine our efforts already back then. And we wanted our country to assume a dignified position in the drive for a safer and more just world. Reviewing the principles and aims of our foreign policy, we generated views that were called "the new political thought." New thought actually meant simple and clear things: abandoning ideological and any other biases, the willingness to review familiar stereotypes, the capability to look at the changed world with a new and broader vision. In concrete terms this meant we had to stop the arms race, first of all nuclear; normalize relations with the U.S. and China, and regulate the regional conflicts that had lasted for decades. We needed dialogue, and most of all trust in international relations. Perestroika had various stages. The creators of perestroika were accused of not having a plan, an idea. But there were no ready-made recipes lying around anywhere. The idea of perestroika was created as it developed, as the people were being liberated. But our determination to unite politics with morality and ethics remained unchanged. We wanted the state and the economy to serve man. Glasnost became the fundamental instrument of perestroika. What is glasnost? Freedom of speech. People finally received the opportunity to speak about their problems, to voice their opinion without fearing censorship and repression. But glasnost is also transparency in the affairs of state, it is the demand that the leadership explains its decisions and takes people's opinions into consideration. That is why I had to object to what our great writer Alexander Isayevich Solzhenitsyn once said in the 90s: "Gorbachev's glasnost ruined everything." I replied that if it had not been for glasnost, the country would have continued stagnating, blocked at a dead-end, and Solzhenitsyn himself would have still been living in Vermont, U.S., where he had moved after his country exiled him. Glasnost stirred society; it opened the eyes of the country's leadership. We saw that people wanted faster movement forward. We understood that to do so it was necessary to democratize all facets of public life, including the democratization of the political system. In 1988, during a party conference, we decided to conduct elections to the highest organs of government on an alternative basis. This was a very important step towards democracy. Today this move, which back then had everyone's enthusiastic support, is subjected to harsh criticism. People say that first we needed to deal with the economy and leave politics for a better day. However, it is enough to remember the fate that awaited the abovementioned attempts to solve the country's problems without first touching the system's political foundations. And today I am convinced that the course we took was correct. It certainly does not mean that the decisions we made were right or precise, that we always acted opportunely. Sometimes we were late, sometimes we rushed. We underestimated the resistance of the opponents of perestroika. At first literally everyone spoke in favor of the changes. But then we realized that not everyone among the people, the leadership and the "elite" was happy about the decisive yet evolutionary changes. On the one hand there were the radicals who meshed with the separatists and, feeling the people's impatience, especially that of the intelligentsia, demanded that "everything be completely destroyed," while feeding the people with irresponsible, unrealistic promises that in a year or two there would be paradise in the country. On the other hand there were the conservatives, who were stuck in the past, fearing real changes, distrusting the people's free choice and not wishing to lose their former privileges. It was them who, having lost in the open political battle, staged the 1991 coup that weakened my position as the country's president and paved the way for radical forces that in a few months destroyed the Union. I fought for the preservation of the union government with political means. I underline –political. It was unacceptable for me to use force, which could have led the country to the brink of civil war. In these conditions a lot depended on the position that Russia's leadership would take. And in the end it chose the way of the country's disintegration. Russian President Boris Yeltsin, who played a positive role in defeating the coup, assumed a duplicitous position. A secret conference was held in Bialowieza Forest [in western modern-day Belarus - RIR], where the leadership of Russia, Ukraine and Belarus announced the dissolution of the Union. I was ready to agree to maximum economic decentralization and to giving the republics the broadest authority. But a completely different decision was taken as the Russian parliament applauded. As a result all ties, even our most important asset, the single defense of the union state, were destroyed. Today we are witnessing the consequences. I could not agree with this. That is why I resigned as President of the USSR. But is the result of perestroika the dissolution of the Union, as many say - some due to ignorance, others out of spite? No. The dissolution of the Union, the hardships and privations that many experienced in the 90s were only the result of the failure of perestroika. But this does not annul the most important thing: The changes that perestroika had introduced were so profound that it was impossible to go back. First and foremost this means political freedoms, human rights – those rights and freedoms that today are taken for granted, such as the opportunity to vote in the elections, to elect your leaders. The opportunity to openly voice your opinion. The opportunity to practice your religion. The opportunity to freely travel abroad. The opportunity to open your business and become successful. Not everything has been realized to the utmost degree, however. In the last years we have seen breakdowns and understandable movements. A lot has caused and continues to cause anxiety. But I am convinced that no one will take perestroika’s main achievements away from the people. I can say the same thing about perestroika's foreign policy results. We ended the arms race. We began the process of reducing nuclear weapons, the stockpiles of which in the 80s would have been enough to destroy the planet over and over again (now the arsenals have been reduced significantly, on both sides). We normalized relations with the West and with China. We left Afghanistan. We have regulated many regional conflicts. The process of the country's integration in the world economy has begun. These are real achievements. But many ask today: Why is the current global situation so alarming? Perhaps perestroika is to blame for this, as well as the new thought that we proposed to the world? No, I do not agree with this. Today's dangers are the results of the breakdown of perestroika, the dissolution of the Union, a departure from the principles of “new thought,” the incapacity of the new generations of leaders to build a system of security and cooperation that would respond to the realities of a global, interdependent world. The opportunities that were presented after the end of the Cold War were neglected. They were not implemented as they should have been. And the main reason for this is the distorted view of what brought about the end of the Cold War. Many in the West welcomed with joy the dissolution of the Union, which had been caused by internal factors. The end of the Cold War, from which both sides and the whole world emerged victorious, was interpreted as the victory of the West's and the U.S. The triumphant mood led to the "only remaining superpower" claiming monopolistic leadership in world affairs and even in the creation of the "American Empire." In the end the world did not become safer. Instead of "world order" we received "global turmoil." Conflicts raged not only through third-world countries but also through Europe. And now an armed conflict is literally standing at our threshold. I will not speak in detail about the Ukrainian conflict. Its core causelies in the breakdown of perestroika, in the irresponsible decisions made in Bialowieza Forest by the leaders of Russia, Ukraine and Belarus. The subsequent years led to the rupture in Ukraine. By pulling Ukraine into the Euro-Atlantic Community, the West has defiantly ignored Russia's interests. No one has gained from this. Everyone has lost. There now exists a real danger of a new Cold and even a Hot War. Now is not the time for reciprocal accusations and maneuvers aimed at announcing victory in the conflict. This conflict does not have a military solution – there will be no victors. It is important to support all constructive measures, all attempts at a more responsible approach that can lead to peace. I am convinced that the large-scale historical challenges that faced perestroika, its ideas and principles –solving society's problems by including people in the political and democratic processes, the evolutionary nature of the changes, the understanding of the interdependency of today's world and the country's determination to integrate with international policy and economy – are still relevant today, both in Russia and in the world. Obviously neither the experience of perestroika nor a foreign policy based on “new thought” presents ready-made recipes for solving today's problems. The world has changed. There are now new "characters," new dangers in world politics. But none of the problems facing humanity can be solved by the efforts of just one country, or even a group of countries. None of these problems has a military solution. The current generation of world leaders must finally understand this. And act accordingly. Russia can make a substantial contribution to overcoming the current "global chaos." The West must understand this. No attempt to isolate Russia or ignore it will be successful. I am convinced that the country can overcome the current economic hardships. But this requires a serious and sober analysis of their causes. With all the poignancy of the international situation and the unpleasant internal economic conditions we must admit that the economic crisis and the harsh economic problems are something that we have created ourselves, something for which we bear the responsibility and must resolve ourselves. And as harsh as the current economic problems are, we must understand that the root of everything is not in economy but in politics. Russian politics still has many challenges facing it, challenges that were on the agenda during the perestroika years. This includes the creation of a pluralistic, competitive political system, a real multiparty system, the formation of a system of checks and balances that would equalize the authority of the branches of government and guarantee a regular change of that government. I am convinced that the discovery of a way out of the dead end in which Russian and world politics have found themselves will occur only through democracy. In other words, we need the democratization of Russia's political life and the democratization of international relations. There is no other way.